Ever since the last time I visited one of my very favourite European cities Budapest, I was really taken with an idea they have there; a wine shop which doubles as a small wine bar where you can sit down and try something, chat about the wine, and maybe also grab a bite to eat. Well, turns out London already has such a place called Vinoteca, and I’m so excited to hear they are coming to Chiswick this month. I gather they have 10 whites and 10 reds open at the bar for you to try at any one time. 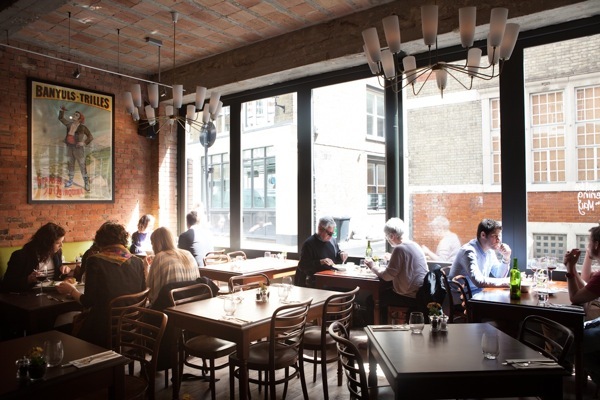 Timeout says of Vinoteca: “even without the fabulous wines, this would still be a great restaurant”. Vinoteca, who have three sites in central London with a strong focus on wines and wine matching, will be opening in Chiswick in late September on one of its foodiest streets – Devonshire Road. Located on the site of the former Oriental Brasserie in a Victorian mid-terrace building, Vinoteca Chiswick will be a wine bar, restaurant & wine shop with an open plan kitchen and seating for around 50 guests, including 20 stools at the long bar for diners who would prefer more casual dining. Around half the seats will be bookable with the rest left for ‘walk-in’ visitors. As always, there will be a ‘dish of the day’ for £10 at lunch – or £12 to include a glass of wine paired to the dish. This intimate, friendly restaurant will feature a wine list of over 270 wines from around the world. Many are sourced from artisan producers, smaller importers or directly from vineyards. All of the wines are available online or to take away from the wine shop at highly competitive retail prices. One notable feature of Vinoteca’s wine list is the range of Bag-in-Box wines. These are premium wines imported directly from the producer and bottled on site. The wines are transported in 5 or 10-litre boxes, which keeps them perfectly fresh, and then bottled in refillable bottles on site to be drunk in the bar or taken away. Not only does this make these wines even better value, but since introducing them in 2010 Vinoteca has saved around five tonnes of glass. The daily changing menu will be Seasonal and largely sourced from British farmers, growers and fishermen. The Modern British menu has strong influences from the wine growing areas of France, Italy and Spain. with carefully sourced specialist produce from these regions running through the menu. Vinoteca’s Head Chef is James Robson ex- River Café , The Wapping Project, Artisan & Vine and the Tabernacle as well as an 18 months as Chef Patron of L’Office in Paris. His background and knowledge will result in a menu full of exceptional dishes to complement the wines served. Charcuterie will also feature, including bespoke Jabugo hams, salchichones and chorizo rojo and blanco sourced directly from Spain.